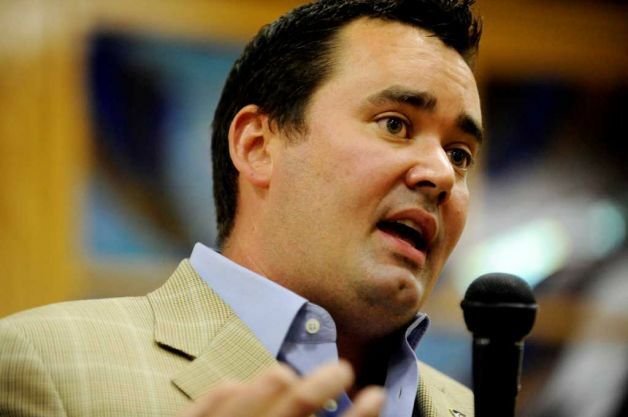 Walker Stapleton. Gazette file photo. State Treasurer Walker Stapleton is officially in the race for governor, Colorado Politics has learned. His agenda features support for the oil and gas industry, addressing Colorado’s road-and-bridge needs without a tax hike and ending the state health-care exchange created under Obamacare for more affordable and sustainable programs. Stapleton promised to be decisive and clear on big problems. He has a history of that as the lead campaigner on a handful of statewide issues that his Democratic opposition is sure to remind voters about, if he makes it out of the Republican primary. Stapleton sounded confident in an interview, citing his track record on opposing Amendment 66, a tax increase for schools that failed nearly 2 to 1 four years ago, and last year’s Amendment 69 to create a statewide single-payer health-care system, which failed nearly 4-to-1. He also faces electoral comeuppance from teachers unions and state employees for being an aggressive critic of the Public Employees’ Retirement Association over the stability of the pension fund that carries multibillion-dollar liabilities that are unfunded. The governing board has refused the treasurer’s recommended reforms. Stapleton also has been the state’s chief proponent of term limits on members of Congress. Stapleton doesn’t intend to beat up on fellow Republicans, however. He said the party has engaged in “circular firing squads” in the primaries that helped Democrats win the last three gubernatorial races. The Republican from Denver has been a presumed GOP frontrunner for months as politicos awaited his entry into the fray. The primary already includes seven Republicans and nine Democrats. His opposition in the Republican primary includes Arapahoe County District Attorney George Brauchler, retired investment banker Doug Robinson, entrepreneur and former state Rep. Victor Mitchell and former Parker Mayor Greg Lopez. Cynthia Coffman also is still considering a run after one term as attorney general. Stapleton became treasurer in 2011 after ousting incumbent Cary Kennedy, who is running for governor in the Democratic primary next year, along with Lt. Gov. Donna Lynne, U.S. Rep. Jared Polis and former state Sen. Mike Johnston. Stapleton’s team would have a hard time positioning him as a political outsider. Besides his two terms in state office, he is a cousin to the presidential Bush family, and his past political donors have included such luminaries as former U.S. Secretary of State Henry Kissinger. The independent expenditure committee that formed to support his candidacy for governor, Better Colorado Now, includes wealthy business leaders and John Elway, the former Denver Broncos quarterback turned team executive and Republican political supporter. Elway backed Stapleton for treasurer four years ago. Stapleton said he was proud to have the support of leaders who have a stake in a well-functioning economy, but when he got in the race for state treasurer eight years ago, his only supporters were his wife and campaign manager. He had no political experience then. Stapleton, 43, was chief executive of SonomaWest Holdings, which manages real estate holdings, when he entered the race for treasurer. He holds a master’s degree from the London School of Economics and an MBA from Harvard. Besides leading the opposition on high-profile statewide ballot issues, he has worked in all 64 Colorado counties to meet with local officials on spending and economic issues as treasurer. His time in office has made him determined, not politically complacent, Stapleton said. Polis and Johnston are campaigning on moving the state to 100 percent renewable energy by 2040. In 2014, Polis put about $2.1 million of his own money into efforts to give local communities more say-so over fracking, wresting some power away from state regulators. Polis’ campaign didn’t respond to a request for a comment on Stapleton’s assertion. Polis told Colorado Politics last month that while Colorado might use less natural gas and coal, that doesn’t mean companies can’t still extract it for other markets. “The exact reason I’m running for governor is because we need a governor who can responsibly develop Colorado’s natural resources with the industry, while protecting the environment and recognizing what a vital contribution this industry makes to Colorado’s economic future,” Stapleton said. He said natural gas is “abundant, it’s right under our feet and it’s cheap. It doesn’t mean we can’t have solar and wind, but, look, wind is 10 times more expensive and solar is 20 times more expensive, and we need to focus on the natural gas that we have in abundance in Colorado.